What I know about child/adolescent development and how it informs my philosophy of instruction. I was an English major and a Women’s Studies major in college and studied American Literature in graduate school, so my formal knowledge of adolescent development is limited. I am looking forward to reading Pressley and McCormick’s (2008) Child and Adolescent Development for Educators and, especially, Brain Rules (I have used the “brain dance”/Bartenieff fundamentals as a cycling instructor.) And I am very much looking forward, as a high school English teacher, to having a larger “toolbox” of knowledge about adolescent development: cognitive, emotional, and social as well as physical. Most of what I know about child and adolescent development I know as a parent, and most of it is derived from own experience and the experience of friends with similarly aged children. I read Penelope Leach’s books on attachment parenting multiple times when I myself was raising kids, “birth to age five,” and I think that successful teaching, like successful parenting, requires a relationship founded on acceptance, consistency, trust, and positive interactions. I recently read Daniel J. Siegel’s (2014) Brainstorm: The Power and Purpose of the Teenage Brain. I like Siegel’s claim, that our society needs the “stormy” nature of the teenage brain, and the resultant ability to take risks, live in the moment, fight for what we believe, and be flexible with changing situations and changing identities. One way in which I hope this informs my philosophy of instruction is by helping me value those qualities in my students as much as I value some of the more “forward brain” qualities (organization and planning and the ability to parse tasks, for example) that I ask my students to practice, and that our public education system requires them to develop. This entry was posted in 3.1, 5.1 and tagged adolescent brain development, positive relations in the classroom on June 26, 2015 by aagaarde. 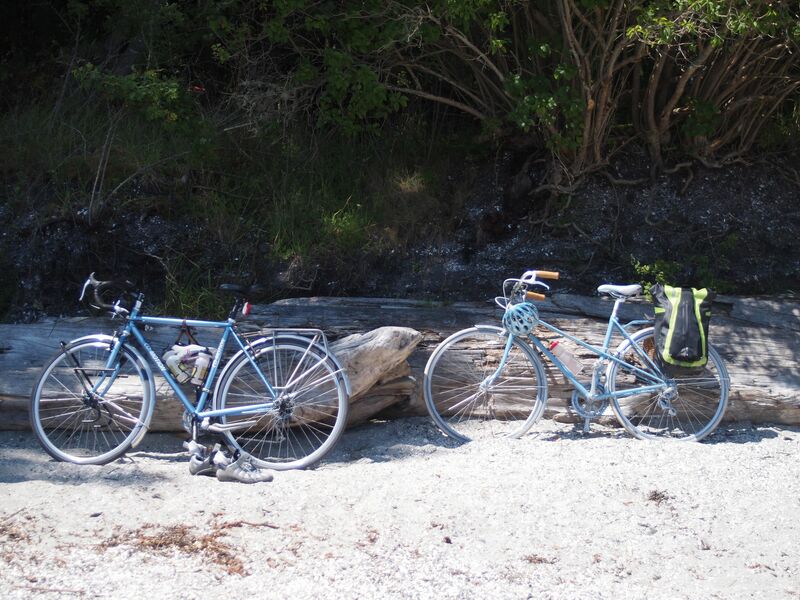 The power of nice…nice beach, nice blue bikes, nice day! Effective educators share a number of common traits. They are knowledgeable (some might add passionate) about what they teach. They are strong communicators, and know how to speak, write, and present ideas and information in ways that their students can access and understand. They are respectful to students and families, colleagues and administrators, and respectful of the diverse backgrounds from which those students, families, colleagues, and administrators come. They are fair, and recognize that fair means more than “equal” or “equivalent.” They create classrooms that encourage success and minimize the need for discipline. And they are nice. Nice is an overused, some might say tired, word. We often associate “nice” with a lack of excitement, a lack of energy, passion, or investment. But I can tell you from experience that nice is also an essential and perhaps underrated characteristic of effective educators. Here’s a story about how I discovered the importance of nice. I have always been a devoted cyclist. I used my bike to get to summer jobs during high school and to explore the rural roads, apple orchards, and native prairies surrounding Northfield, Minnesota when I was in college. I rode my bike to teach classes and to office hours in Berkeley, and I hauled small children to preschool and Kindergarten in a bike trailer. But I was 40 years old before I decided that I needed to learn to take care of my bike as well as ride it. After taking a “fix a flat” class at my local bike club and learning how to do basic repairs and maintenance from a good friend and long-time bike mechanicI decided I was ready to tackle more advanced projects. I signed up for a class on bearings and wheels at a bike shop several miles from my home. The first two classes were awesome, and I left confident in my ability to pack and adjust hub bearings and replace and adjust headsets. The third class was on bottom bracket bearings, and for some reason the instructor, that evening, was in a foul mood. He yelled at a number of students, picked out several mistakes as negative examples in front of the whole class, and fluctuated between short-tempered instruction and outright temper tantrums the entire 2 hours. I was so worried about trying to please the instructor that I couldn’t learn a thing, and to this day I am flummoxed by internal bottom brackets even though I retained most of the other skills I learned in that class. Students need to focus to learn, and if they are focused on pleasing the teacher (preventing a temper outbreak) rather than the subject at hand they cannot learn what they need to know. So teachers need to be nice: reliably, pleasantly, kindly, unobtrusively nice. And when the students that I tutor tell me, at the end of the year, “Oh, Miss Ellen, you are so nice,” I take it for the genuine complement to my teaching that I know it to be. This entry was posted in 5.1 and tagged effective teachers, importance of nice on June 23, 2015 by aagaarde.